“This campaign is everyone’s dream,” said the Associated Church Press judge who gave a Best in Class/Award of Excellence to Catholic Extension for its marketing campaign developed around a cartoon cutout of Pope Francis. The campaign was picked up by major media outlets across the country, and even caught the attention of the Pope himself. We launched our Flat Francis campaign in April 2015 to generate excitement for the first visit of Pope Francis to the United States in September. We also wanted to spread awareness about Catholic Extension, a national fundraising organization that supports the Catholic Church in 94 financially struggling mission dioceses throughout the United States. 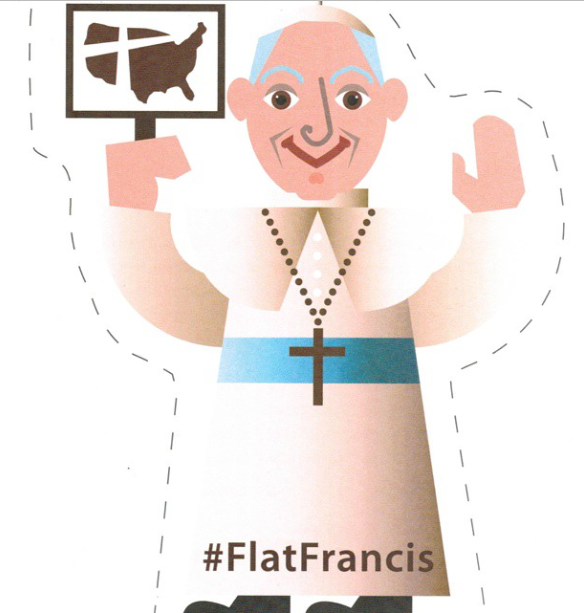 We asked Catholics to help us show Pope Francis the many faces of the Catholic Church in America by downloading a PDF of our Flat Francis cartoon cutout and posting a photo with the cutout on social media with the hashtag #FlatFrancis. We collected all of the submissions, reposted many of them to our social media accounts and website, and ultimately created a mosaic of the images that was delivered to Pope Francis at the Vatican. We hired an artist to design the Flat Francis cutout, which we posted online as a PDF at www.flatfrancis.org and promoted on our website, in email blasts to donors, and on social media. We sent out several rounds of press releases that generated numerous stories about the campaign in the Catholic and secular press. We also reached out to Catholic celebrities to participate in the campaign and received posts from Father Robert Barron, comedian Jim Gaffigan, CNN news anchor Anderson Cooper and more. We also distributed hard copies of the cutout to Catholic churches and schools around the country via our quarterly Extension magazine. We used the hashtag #FlatFrancis to collect posts on social media and encouraged those who were not on social media to email their photos directly to us. When our Board of Governors met Pope Francis on a pilgrimage to Rome, our president showed the Pope the cutout of Flat Francis, causing Pope Francis to erupt in laughter. Video and photos of the moment have been used widely in the press and even in a national TV commercial for Twitter. When the Pope arrived in the United States, we organized an event in downtown Chicago with a life-size cutout of Flat Francis and encouraged passersby to stop for a photo. The event was covered by every major Chicago media outlet. The Flat Francis campaign succeeded beyond our wildest dreams, giving Catholic Extension unprecedented coverage in the media and new exposure in Catholic communities throughout the United States. The Flat Francis PDF on our website was downloaded more than 21,000 times and more than 5,000 people posted #FlatFrancis photos on social media. We received photos from all 50 states and with almost 60 bishops. The video of the Pope seeing Flat Francis received more than 49,000 views online. Our website traffic doubled for 3 days after we posted the story and a clip of the video was featured on a Twitter TV commercial that aired nationally and has more than 8 million views on YouTube. Flat Francis helped us increase our social media presence on Facebook, Twitter, and Instagram, as our following saw tremendous growth on those platforms in 2015. The campaign generated phenomenal word of mouth among Catholic parishes, schools and groups, introducing Catholic Extension to new audiences and potential donors. From a PR perspective, we gained more media coverage from this campaign than from any previous efforts we have undertaken. The press—especially in Chicago, where we are headquartered—have been paying more attention to us ever since. Please see the attached documents for a PDF of the Flat Francis handout we provided at events/through our magazine and distributed online, a Powerpoint with results of media coverage garnered by Flat Francis, and a PDF of a Chicago Tribune article that ran on page 3 of the print edition.